Mike began training in Australia in 1984 and reached the rank of Nidan in 1996. In that time he was fortunate enough to train with many top instructors in several countries. He has also trained with a variety of different martial arts styles and has taught self-defence classes in Australia, Canada and Great Britain. A former tournament champion himself, Mike ran a successful dojo in Australia with students achieving first place in regional, state and national events. A rock-climbing injury in 1997 forced Mike to retire from formal training around the same time he and his wife and fellow instructor, EJ moved to Canada. Since that time Mike focused his energies on the non physical aspects of Karate until he was fit enough to train again. He has been training and teaching students on Gabriola Island since 2005 and is a nationally accredited judge. Mike's background is in environmental studies and education and he is involved in marine conservation. EJ Hurst started training in Goju Ryu in 1986 before switching to Kyokushin in 1992. 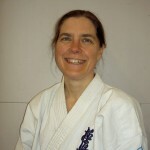 She obtained her Shodan in 1997 after a successful full contact and non-contact tournament career. She is one of the few women to complete the grueling 40 person kumite as part of her Shodan examination. She has trained with many top instructors in different parts of the world and has experience in a variety of other Karate styles. EJ is a trained environmentalist and works in the publishing industry focusing on social and environmental change. The Gabriola Island Kyokushin Dojo started informally in 2005 with a couple of island families getting together for fun and exercise. Initially training in the backyard of one of the family’s home, the group moved to a converted carport in 2007 and started at the Community Hall one day a week in 2008. Now all weekly classes are held at the Community Hall with some special sessions still in the carport! Apart from weekly training, the club periodically also has special sessions on kata, kumite tamashiwari and goshin jitsu. In the summer months we occasionally do water training at the beach and for brave souls when we get snow, there can also be snow training available! Students are encouraged to train hard and challenge themselves while having fun. Respect for oneself and others is the underlying philosophy in the club. Gradings for new belt levels are held each spring and fall and there is also an opportunity to grade at the summer camp. Social activities are held after significant events and occasionally just for fun.